With the New Year right here, it’s time to start thinking about setting some goals and making some serious resolutions for 2018. Along with all the usual stuff – like making sure I find more balance, making being healthy a priority and spending loads of time with my family, I’m thinking 2018 also calls for some resolutions related to money. We can all use a moment of reflection when it comes to finances, and for me, that means being much more in tune with spending and being intentional with the way I save for the future. For many of us, money talk is an easy one to avoid – so let’s take some time to face it and get down to business. Ready? Here’s a look at three money resolutions to make in 2018. Be aware. Sometimes it’s pretty easy to get your spend on. You’re making money or perhaps making more money than ever before, and suddenly it goes out just as quickly as it came in. Rather than watching your cash fly in and out the door, think about being much more thoughtful when it comes to the way you spend. Make decisions about spending with the utmost of care in mind – choosing what and where to spend on only the things you want or love. Financial awareness is half the battle when it comes to dialing it back a notch and knowing exactly where your hard earned cash is going. Stick to a budget. This one is easier said than done, I have to admit! I think the key to a budget is making it doable and realistic rather than something that makes you feel completely constrained. Being real about a budget means having an honest conversation with yourself about how much you spend on things like groceries, gas and nights out. Keep track for a month or so to get an honest picture of your spending habits and once you have the full scoop, start building a budget from there. Make sure everyone’s on the same page. If you live alone and this is a one-person project, you only have yourself to be responsible for. 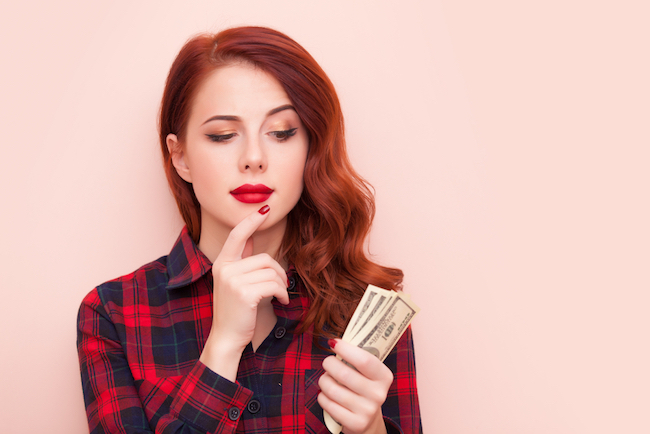 But, if you share your finances with a partner or you have a whole family to feed, it’s essential that everyone understands the goals and the parameters of the financial resolutions. If you’re dialing back your spending, it’s important to know in what categories and how – and, also that you’re on the same team with this project. When one person is on board to make some financial changes, but the other is not – things could get real tense, real quick. So how about it? Could these three money resolutions help you make some major financial resolutions for 2018?